You are purchasing a certificate good for a Fitness Assessment and four 60 minute Personal Training Sessions with a Nationally Certified 3CLICK Personal Trainer anywhere within a 25 mile radius of 1209 Tyler St NE, Minneapolis 55413. New Clients Only. Appointment necessary. 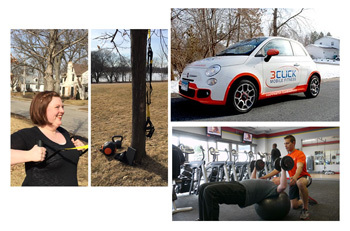 Colleen Lindstrom has been raving about 3CLICK Mobile Fitness and now you can too! Personal Training provides you with the expertise, support, motivation, and accountability that you need to achieve your fitness goals. Enjoy the convenience of easy on-line scheduling and same day service – all with a Happiness Guarantee. Train on your own or with a friend, family member or co-worker at your location or choose from our many metro-wide 3CLICK Mobile Fitness affiliate locations. 3CLICK Mobile Fitness… Your Location, Your Trainer, Your Time … Happiness Guaranteed!